Edward Kearney/Carney and Annie née McCool lived in the neighbouring townland of Ardaganny close to Letterkenny Donegal Ireland. and had seventeen children, the youngest of whom was born in 1874. 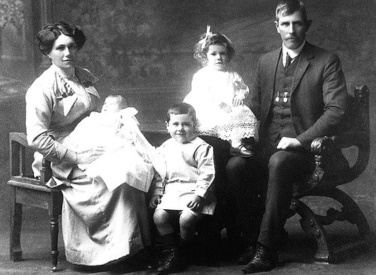 Four of this family emigrated to New Zealand, while the others either remained in Ireland, or emigrated to Scotland or the United States. 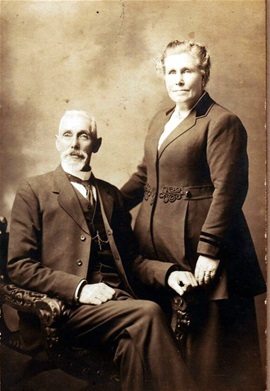 Annie nee McCool (1826-1926) and Edward Carney/Kearney (1816-1892). Patrick Dougherty and Annie née Diver lived in the townland of Fycorranagh, very close to Letterkenny, Donegal, Ireland. At least seven of their children seem to have emigrated to New Zealand. Thanks to Paul Rooney for these photographs. Maybe the house of the McCools. Catherine, Sarah's sister was to have married Charles Doherty/Dougherty. Kathleen one of Andrew and Elena's twin daughters tells that her father Andrew was accompanied by his sister Catherine on their voyage to New York and that she died there. Passage with both Andrew and Cath Kearney with Andrew being 17 years and Cath 19 years has been found. It has been said that Sarah never forgave her Mother for making her marry Charles. Sarah nee Carney and Charles Dougherty. Charle's complexion was dark, eyes a brownish grey hair white. Sarah's complexion was very fair very nice her eyes were blue and her hair was fair with only a few grey. Sarah Kearney was born at Ardaganny. Co. Donegal Ireland on the 13th December 1866. She married her second cousin Charles Dougherty born 1851 at St. Euans Church Letterkenny. Co Donegal. on the 30th July 1882. 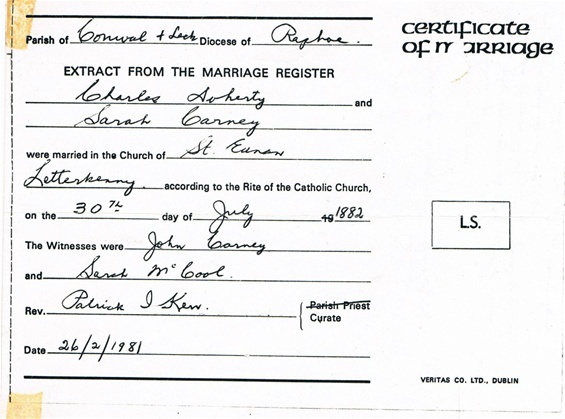 The Parish Marriage records reveals the surnames of Carney and Doherty were used. The witneses at their wedding were John Carney (Sarah's brother?) and Sarah McCool. Charles was a son of Patrick Doherty of Fy Correnagh.Co Donegal. A family story relates that Charles's original bride was to be Sarahs's sister Catherine. The latter died and Sarah was pushed into marrying Charles. Sarah appears to have been a relunctant 16 year old bride for after leaving home she never wrote back to Ireland a decision she regreted in later life. Fy Correnagh is a small 88 acre township close to Ardaganny. The following year they sailed for New Zealand. A short stop was made at Maryborough, Queensland Australia, where their first child Patrick Francis was born. In late July 1883 the family arrived in New Zealand and initially settled in Oamaru where their second child Annie was born .We think Oamaru was probably chosen because Sarah had some family already settled there. Maybe cousin McCools. Four brothers and two sisters of Charles had already immigrated to New Zealand. In August1885 Sarah's brother Ned was granted the lisence of section 18 block 4 subject to a reduction of 5 acres for a gravel reserve. The Dougherty's shifted to Gimmerburn living in a house belonging to Sarah's brother Ned section 18 block 1V. Ned's brother Neil and later Andrew owned the leasehold to neighbouring Section 19 block 1V. In 1891 Ned transfered a defered payment lisence to Charles of section 18 block 1V. This farm was later expanded in 1897 by the purchase of a property known as the "Coal Pit" situated at the foot of the Garibaldi Gorge, Leo Dougherty says that James & William Mcknight (Coalmining brothers) had built the coalpit house. Charles applied for a lisence to mine lignite coal in 1897. The farm supplied coal to the district, and Charles in partnership with Mr R. Little, contracted for the county forming several roads in the area. The Coal Pit house sadly burned down on the 22/1/2013. Sarah and Charles had a family of four boys and seven girls, a little boy Edward, died 26/12/1898 aged 4 years. Three descendants became all Blacks. J.C.Kearney, K.C.Stuart and R.C.Stuart. the latter captained the All Blacks. Charles's sister Barbara (never married) who had kept house for their brother Bernard (Barney) died in 1912 leaving one of her properties to Charles. It was about that Charles and Sarah moved from Gimmerburn to the Barney’s Lane property. Sarah was always so homesick for her beloved Ireland and she loved going to visit Ellen and Pat in Oamaru and when she got to Shag point and saw the sea she just loved it. Her happiest days though were at Gimmerburn walking and working on the mud brick floors. Charles was 6 foot tall very slim man the piecemaker in the family I have been told. He suffered from consumption for years and wasn't expected to live very long but lived his 78 years. Charles died 2nd February 1929. Sarah died the same year on the 4th September 1929 aged 64. They are buried in the cemetry at Ranfurly New Zealand with their little boy Edward. Charles and Sarah marraige certificate. Taken c 1896. Probably the house on the the first ground Charles purchased. 120 acres beside Sarah's brother Ned's land Sharkey road Gimmerburn Otago N.Z. Charlie, Annie, Mag, Kate, Mrs Sarah holding Edward who died in 1898 aged 4 years, Pat and Mary. The Dougherty House near the coalpit. Probably bought with the ground and coal mine off James McKnight. Sarah and Charles's son Charlie added on to it. The last of the Dougherty family who lived here was Wendy and Des Dougherty and their three small children. Sadly the special old Homestead was burnt to the ground on the evening of the 22nd January 2013. It had been used by Garrawaye owner 5th generation Stephen Dougherty as a hunting lodge. Lawrence Dougherty looking helplessly at the remains of the special Dougherty house having been in the family since the late 1880's. James & William Mcknight Coalmining brothers, sons of Ann and Alexander McKnight of County Derry Northern Ireland. William 1820-1893 and James 1833-1894 both buried in the Gimmerburn cemetery. James had 65 acres of land plus he probably mined the coalpit. His estate was left to James Scott a labourer who lived with him and he was to pay his brother Williams funeral and James's and other monies owed. Charles Dougherty applied for a lisence to mine lignite in 1897. 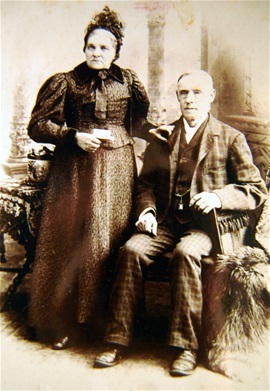 Charles Dougherty with his daughter Annie who married widower James Cussack. Mary and Dora Cussak James's daughters. 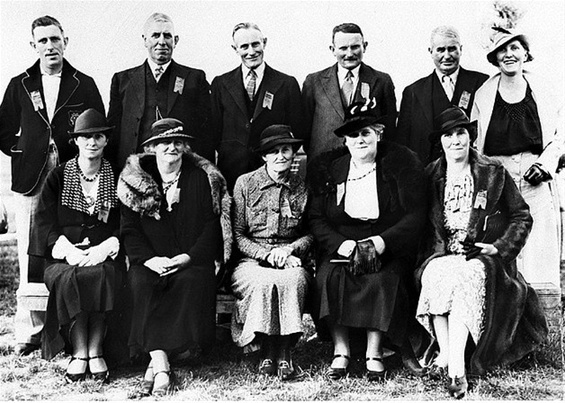 Brothers and Sisters of Charles who also came to New Zealand, arriving earlier. Philip Dougherty- Philip Dougherty enlisted in the 12thg regiment in England about the year 1863 and completed his enlistment in 1873. He then reinlisted under the name of Patrick Diver, his Mothers maiden name his Father's name was Dogherty One of these enlistments was in the 12th Regiment on foot and he served in New Zealand for about six years in the Maori land wars. He became ill about 1877, and asked his family in Ireland to buy him out six years early so that he would not have to complete this time and would not be posted to India. He died in June 1879 in Liffen Hospital County Donegal. This was taken from Patrick O'Neill's research. Please go to link below. Neil Dougherty- Born in Co Donegal about 1853. He came to New Zealand with his brother John and Bernard and mined in Spec Gully Mt Ida N.Z. appearing on the electoral rolls for the year 1875 - 76. He and Bernard living in Spec Gully in a sod and tin hut. He married Hannah McGillicuddy (born about 1860 in Kerry Ireland) on the 7th of January 1879 in St. Patricks church Oamaru N.Z. As far as I have found they had 6 children. Neil died 2nd July 1909 in 41 King Edward Street Cavesham Dunedin New Zealand. Hannah died 3rd July 1932 in 3 Main Avenue St Clair Dunedin New Zealand. They are buried in the Southern cemetry Dunedin Otago New Zealand, Children of Hannah and Neil. Bernard DOUGHERTY Bernard "Ben" died 28 Aug 1933, at Auckland, eldest son of the late Neil and Hannah Dougherty, late of Oamaru aged 55. Ben fought in the Boer War, and WW1. He was invalided out with wounds received in action. When he attested to the Army he was Benjamin DOUGHERTY, but was also known as Ben. He is buried in the soldiers section of the Waukumete Cemetery Auckland Buriel C Row 2 Plot 24. Annie Jane "Jean" b. 21 Feb 1884, Oamaru district Otago, New Zealand d. 5 Dec 1971, Dunedin, Otago, New Zealand (Age 87 years). She married William George Robertson. Henry George born 1884 died 1951 aged 62 married Agatha Margaret Mansfield died 1969 aged 78. buried Andersons Bay cemetry Dunedin New Zealand. 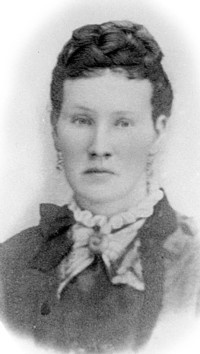 Jessie Mary b. 20 Dec 1887, Ardgowan, Otago, New Zealand d. 19 Dec 1955, Lower Hutt, Wellington, New Zealand (Age 67 years) she married Hugh Mulholland 1914. 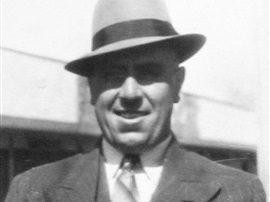 William Francis "Frank" b. 1889, Ardgowan, Otago, New Zealand d. 3 Nov 1951, Dunedin, Otago, New Zealand (Age 62 years) married Helen Sophia Porter. John Dougherty - Born about 1844 in Co Donegal. He came to New Zealand before his parents and Gold mined in Naseby for a number of years then farmed in Gimmerburn. 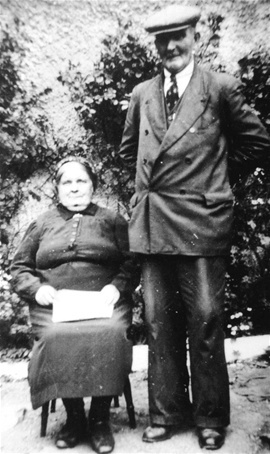 He married Margaret McCool (born about 1845/46 in Ireland) at a McCools in Naseby N .Z. on the 8th May 1872. Margaret died 11th April 1901 in Naseby N.Z. John Died 14th October 1922 they are buried with three of their children Andrew, John Patrick and Neil. Children of Margaret and John. Patrick John born 1884 married Mary Mulholland in 1928. Patrick John served in WW1 until he was discharged with Tubuclosis. Bernard Dougherty (Barney) - Born about 1836 in Co Donegal Ireland. He came to New Zealand with brothers John and Neil and mined at Naseby his name in the N.Z. 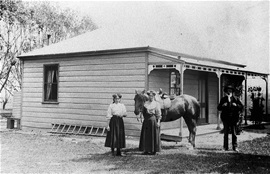 electoral rolls of 1875/76 living at Spec Gully Naseby in a sod and tin hut. Bernard died at Ranfurly on the 23rd April 1908 aged 72 He is buried with his sister Barbara in the Ranfurly cemetry Otago New Zealand. Barneys Lane is a well known road on the Maniototo which is named after Bernard (Barney). The road begins 2Km from Ranfurly and runs in an almost direct line to the Dougherty Farm of the present day. Annie -Born about 1862 died 24th December 1906. She kept house for her brother Bernard, married a widower Mr.Cussack who had two choldren they all lived in Lawrence. Barbara Dougherty - Born born 1848 in Co Donegal Ireland. She had aquired quite a lot of land. She left one of her properties to her brother Charles Dougherty and one to her nephew Ben Dougherty son of Charles. She never married and kept house with her sister Annie for her brother Bernard (Barneys Lane) and died in Ranfurly on the 16th September 1912 aged 64. She is buried in the Ranfurly N.Z. cemetry with her brother Bernard. Margaret Dougherty. There was mention of Margaret Dougherty in Barbara's will when she gave money to Parish Priest to pray for her, Bernard, Philip and Annie. Not another thing is known of Margaret we don't know if she came to New Zealand, the States or stayed in Ireland. Maybe she died before they all emmigrated? 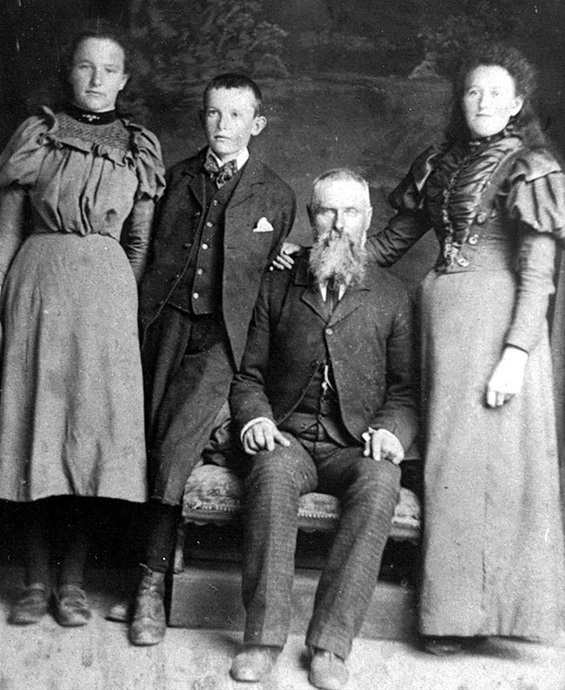 Charles's brother John Dougherty and his children Sarah, Patrick John and Annie. Dougherty Cousins at Gimmerburn School Reunion 1937. Rear: Ben, Big Pat, Thin Charlie, Wee Pat (JM) Fat Charlie (JM) Emily O'Neill. Front: Lucy O'Neill. Sarah Mulholland (JM) Annie MaDonald (JM) Annie Kearney, Maggie Stuart. JM family of John and Margaret Dougherty, others are the children of Charles and Sarah Dougherty. Ellen and Edward (Ned) Kearney Sarah's brother. Taken at Ophir around 1910. Neil- Neil was the eldest of Edward and Annie. He came to New Zealand in 1870 and was presumably the ploughman who competed at the Mt Ida ploughing match held on the 23rd of September 1877. He was driving a team pulling a Reid and Gray plough for John Crighton and earned 4th place. It is likely that he was a miner in Naseby initially, there was a mining claim lodged at Kearney creek in 1881 and three in the following year. In 1883 ther were no claims lodged. As Neil and his brothers Andrew and Edward were the only Kearneys mining in that period it is likely to be named after them. Neil was a farmer in Gimmerburn from 1880's onwards. His sister Sarah and her husband Charles moved into a house on his property in 1888. 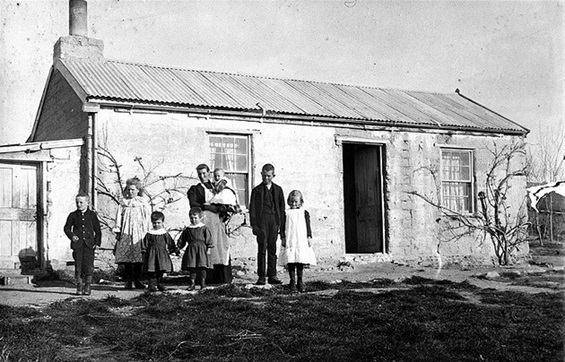 When the effects of the farming ecnomics depression began to reveal its adverse consequenses in the 1880's early 1890's the government began the policy of giving potentially hard working farmers lacking capital a chance of gaining productive employment by renting them unallocated crown land leases at very low rentals. A sustantial area had been set aside for mining purposes in the 1860's but short term grazing rights could be applied for and if there was no objections from miners leases granted. The Kearney brothers and brother in law Charles Dougherty were all interedted parties in these farming oportunities. Neil suffered with a speech impairment as he had no roof in his mouth. In later life he lived in the original mud-brick cottage at the farm in Barneys Lane and when it became a Dairy he lived in the other half of it. In old age he became crippled with arthritis. He died in the Little Sisters of the Poor in Dunedin on 6/11/1933 aged 85 he is buried in the Ranfurly Cemetry. Neil never married. Andrew - Andy was the secon eldest known son of Edward and Annie. He retaines the name Carney when he came to New Zealand in 1875. In1881 he is listed on the Mt. Ida electoral rolls as a miner at Naseby. He with his brother Ned he is listed as a farmer 1887-1988 in Gimmeburn. He married Ellen Lena Carmody a barmaid in Naseby who was born About 1876 in Norfolk Tasmania. Australia they married on the 25th July 1906 in the Roman Catholic Church Clinton South Otago New Zealand. Andrew was 45. They had twin daughters born 1907. Ellen Lena died on the 10th February 1912 and buried in the Lawrence cemetry. The twins were taken in by Annie daughter of Margaret McCool and John Dougherty until Annie married Michael Joseph McDonald. They then were bought up in an orphanage in Dunedin and looked after by Mary Dougherty (professed sister of Mercy Sister Alonza, daughter of Charles and Sarah. They were enrolled at the Blacks school by their Uncle Ned Kearney on the 11th June 1917 for a short time while their boarding school was closed due to illness, They stayed at Blacks school till they left for Dunedin on the 28th March 1918. Marjory died of Pnuemonia when she was 21. 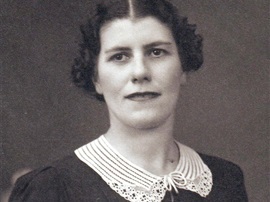 Kathleen Anne married Bill Ryan and died in 2007 aged 100. Andy died 19/5/1939 aged 85 and is buried in Andersons Bay cemetry Dunedin New Zealand. Remains of Andys hut at Gimmerburn. The last person to live here was Oliver John Clunie a rabbiter. His family lived in Kyeburn there is a road there called Clunie road. He is buried in ther Kyeburn cemetry. Kathleen and Majory Carney/Kearney twin daughters of Andrew and Elena. They were born the year he sold his land. Andrew was 45 years old when he married Elena. He lived in the Fire station at Naseby and had his eye on her for a while Elena Carmody was a barmaid in Naseby. Children of Sarah and Charles. Mag, Annie and their Father Charles at their Barneys Lane House. before 1914. Patrick Francis Born in Queens Street Maryborough Queensland Australia 24th September 1882 died in Gore on the 10th June 1965. Annie - born Oamaru 27/8/1885. m. John Edward Kearney at Sacred Heart Church Ranfurly 24/6/1914 d Ranfurly 1/7/1966. Children: John. James. Patricia. Edward. Mary - b Oamaru 25/7/1887 Professed Sister Mary Olonzo Sisters of Mercy. Died Dunedin 19/10/1969. Charles - born Gimmerburn 23/8/1889. m Annie Elvina Dickison at St. Josephs Cathedral Dunedin 15/8/1935. died Dunedin.. Children Charles b 1940. Catherine -born Gimmerburn 13/7/1891. m John Stafford O'Neill at St. Josephs Cathedral Dunedin 19/1/1921. Catherine died Dunedin 8/8/1957. John 10/5/1976. children Catherine. John. Maggy Boreena - born Gimmerburn 14/6/1893. m Robert Stuart at St. Josephs Cathedral Dunedin 13/4/1920. Mag died 8/8/1976 in Christchurch. children Robert. Margaret. Marie. Thomas. Kevin. John. Edward - born Gimmerburn 12/6/1895 died 26/12/1899 aged 4 years. Sarah - born Gimmerburn 29/7/1897. m John Tohill at St. Josephs Cathedral 18/11/1920. children Moira. Lucy.Patrick. Eileen. Charles. Maeve. Nora. Judith Anne. James Henry. Lucy - born Gimmerburn 28/11/1899. 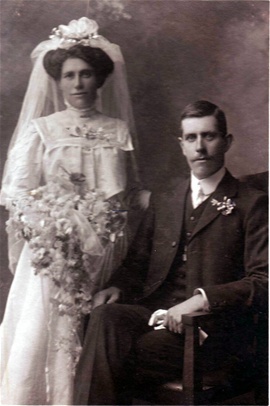 married Vincent Patrick Sarsfield O'Neill St Patricks Bascilica South Dunedin 21/7/1931. 'Scully' died 18/6/1977. Lucy died Ranfurly 17.2.1980. children Margaret. Angela. Moyra. Lucy. Bernard (Ben) - Born Gimmerburn 3/7/1904. married Marry Anne Gabriel (Grace) Wright. St. Josephs cathedral Dunedin 14/6/1933. Ben died in Auckland 1/11/1982. Children Bernadette born 10/7/1944. Lucy married Vincent Patrick Sarsfield O'Neill. There children are Margaret, Angela, Moyra and Lucy. 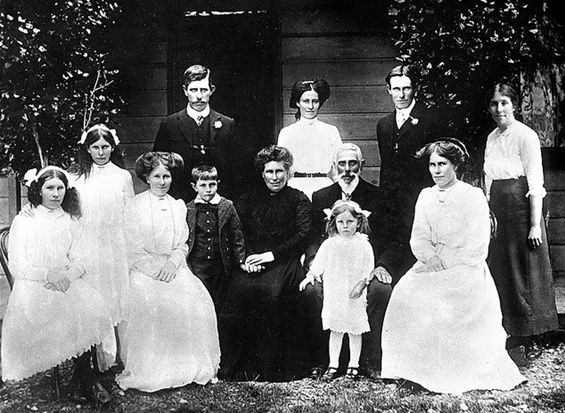 Dougherty Family at the Barney's Lane House, could be Pat's wedding day to Ellen Spedderi 1909. Rear: Pat, Kate, Charlie & Mag. Front; Sarah, Lucy, Mary, Ben, Sarah & Charles, Emily & Annie. Second son of Sarah and Charles he married Elvina Dickison and they had one son Charles Patrick (Young Charlie). Emmie married Jack O'Neill. Their children were Bernard, John, Colleen, Leo and Sally. Maggie married Bob stuart. Their children were Kevin, Tom, Marie, Bob, Peggy, Kevin and John. Kate married John O'Neill. Their children are Catherine (Molly) and John. Ben married Grace Wright. They had a daughter Bernadette who married Brian Butel. Annie married Jock Kearney. Their children John (Poly), James (Jimmy), Edward (Eddie) and Patricia. Sarah and Charles with their little boy Edward aged 4 on the Ranfurly Cemetry New Zealand. Bridget Ellen Spedderi married Patrick Francis Dougherty at Sacred Heart Church in Ranfurly 8/9/09. On marrying, Ellen and Pat lived in the Spedderi home with Ellens' brother Larry Spedderi. Five children were born to Ellen and Patrick. 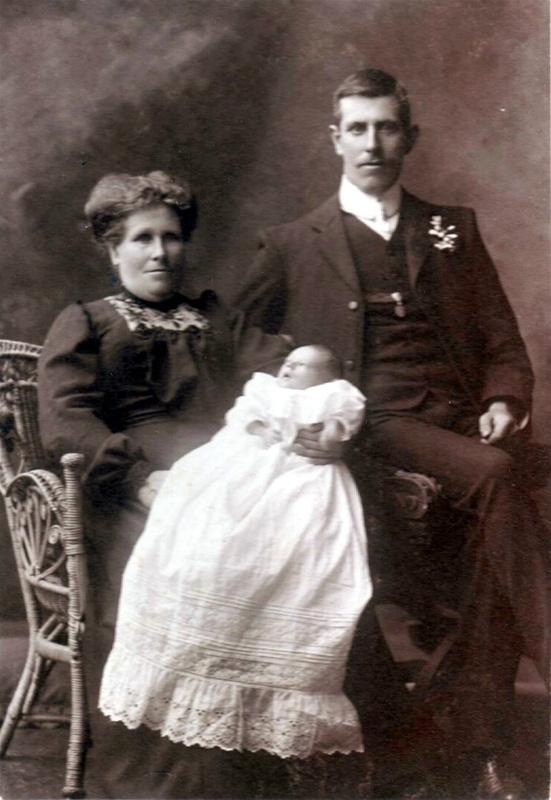 Their first son Patrick James Charles died at 6 weeks of whooping cough in Oamaru 15th January 1910. Mary Agatha died at Teschmakers on the 12th June 1923 aged 8 years. Patrick Francis Lawrence died at Teschmakers 6th February 1925 with an epileptic fit aged 8 years. Leo Charles Spedderi born the 19th August 1911. Helen Bridget (Nellie) 26th October 1912..
Three Generations: Sarah with her elsedt son Patrick and baby Francis on 1909. Little Francis died at 5 weeks from whooping cough. 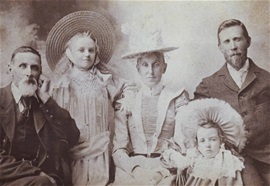 Ellen (nee Spedderi) and their three children. Mary Agatha died aged 8, Leo Charles Spedderi and Ellen Bridget Sarah Mary(Nellie) Patrick Francis Dougherty in 1915. Patrick Francis Lawrence Dougherty died at Teschmakers on 6/2/1925. Mary Agatha Dougherty died at Teschmakers on the 12/6/1923. Both little children are buried in Oamaru with their Mother, Father and little brother Patrick James Charles Oamaru died 15th January 1910 of whooping cough. Known as Nellie. She married Albert Watson. They had five Children. Helen, Patricia, Raymond, Johnny and Mary. 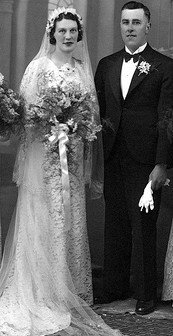 Leo married Eileen Elliot. They had seven children. Leonie, Lawrence, Bernard, Des, Frances, Patrick and Karen. Ellen and Patrick along with Leo and Nellie, left the farm at Gimmerburn in the hands of a manager Jack Miller. After 2 years the farm was leased to neighbour Jim Kerr for 14 years. The purpose of leaving the farm at this time was to give the children an education. They moved to Island Stream near Kuriheka in North Otago. Leo and Nellie went to the Maheno school Leo almost 7 by then. They stayed at Island Stream for a year they milked cows and had a few sheep. The family them bought a farm near the Catholic Girls School called Teshmakers in 1919. Leo and Nellie then went to this school. Leo went off to Christian Bros school in Dunedin for the years of 1924 - 1925 - 1926, then in 1927 St. Kevins College was opened in Oamaru Leo being the first day pupil. On leaving school he worked a team of horses on the Teschmakers Farm which was a cropping farm. Pat and Ellen sold their farm selling it for the same price which they had bought it, this was the time of the depression and 3 years of drought. Many farmers in the area went broke. Pat and Ellen received enough money to buy a house in Trent Street Oamaru. Leo met Eileen at a nurses ball in Oamaru she was a registered nurse at the Oamaru hospital. They married on the 15th September 1937 and returned to the farm in Gimmerburn Larry Spedderi went with them. Pat Poppa Dougherty nursing Des. Leonie. Lawrence. Bernard and Ellen nee Spedderi nursing Francie. 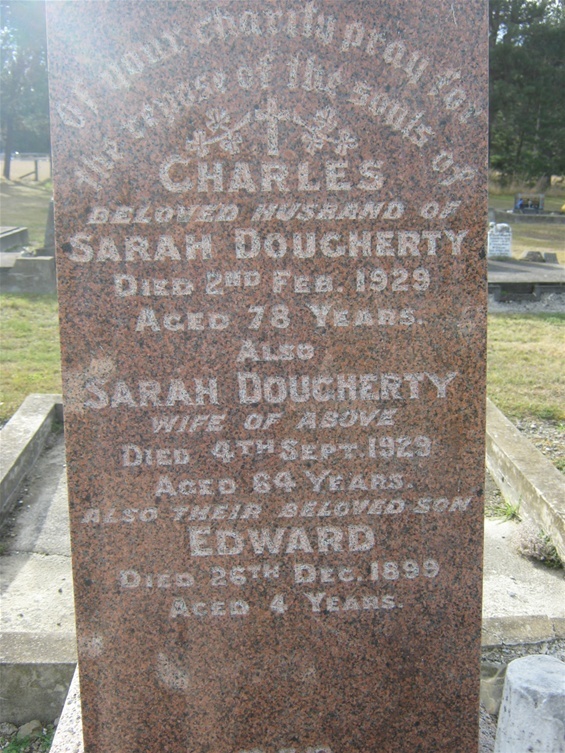 Dougherty Family Buried in Oamaru. This is the headstone of Patrick Francis (Poppa to his Grandchildren) died 10/6/1965 his wife Helen Bridget (nee Spedderi) died 19/6/1947. 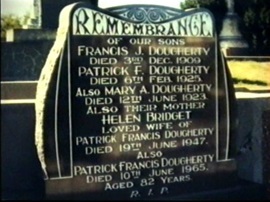 and their children Francis John Dougherty died 3/12/1909. Patrick F. Dougherty died 6/2/1925. Mary A. Dougherty died 12/6/1923. 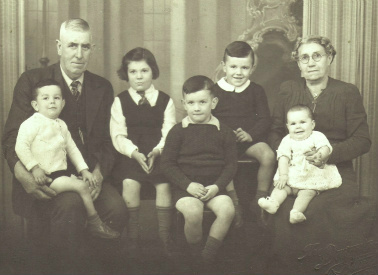 Lawrence, Carol nee Evans, Francie, Bernard, Patrick.. Des, Roderick Dunn son of Dorothy Dunn nee Elliot, Pat and Leonie O'malley nee Dougherty, Leo his father Pat (Poppa), Winnie Elliot nee O'Brien and Mina Elliot (nursing Larry son of Carol and Lawrence Dougherty) Mother and sister of Eileen nee Elliot in front Karen. Photograph taken at the end of the Dougherty cousin reunion 1995. Decendants of Eileen and Leo Dougherty. Family of Carol and Lawrence Dougherty. Paul, Stacey Weir, Deb nee Anderson and Larry, Greg , Billy, Steve and Nicky nee Howell, Paula Shortall, James, Tom, Charles, Carol nee Evans, Tia, Maggie, Tory, Sarah and Lawrence. Decendants of Patrick Francis and Ellen Dougherty. Dougherty Reunion at Gimmerburn 2007. Son of Patrick and Ellen, Leo Charles Spedderi Dougherty is sitting in the wheelchair second row. 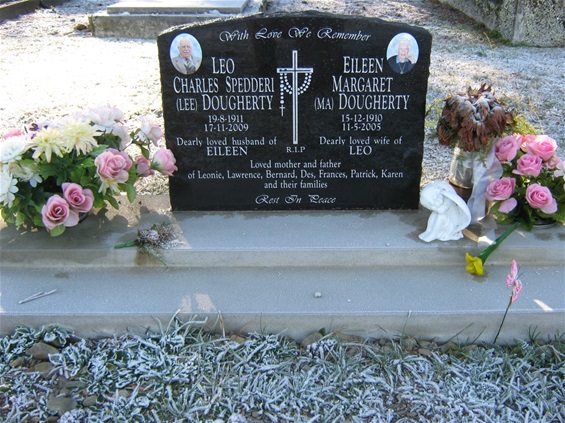 Eileen and Leo Dougherty in the Ranfurly Cemetery. Other Dougherty links on this Website. Dougherty Rugby Team Sons, Grandsons and Greatgrandsons of Eileen and Leo Dougherty 2007. Thank you for correction Russell. I hope you see the replies you have no email for me to reply. Good to hear from you I remember you kids staying at Gimmerburn. I married Leo's son Lawrence. Hi just discovered this website I am related to to Dougherty my greatgrandfather was Neil Dougherty who married Hannah McGillicuddy in oamaru. Hello, I am a descendant of a Dougherty family that also migrated to NZ in 1848. My 3xgreat grandparents were Hugh and Mary Dougherty. They had 10 children. I am not of the Dougherty clan. The Harwoods were very close friend of my family and I would be able to answer many of Gillians questions. Have photos too. I knew Lillian May Harwood...she was a most beautiful person. She played a very important part in my young life. There is much more that could be told. Thankyou for you message Patrick what brancvh of the Doughertys are you?